Fed up with the small town day to day in Farber, Texas, high school graduates, L and her best friend, Leah, have made a vow to make this summer the best summer of their lives. With little direction and no real plan, the summer, unfortunately, seems to be shaping up like any other. That is until their favorite band of all time, Brick Party Sundae, announces the Texas leg of their tour. L and Leah decide there couldn't be a more epic way to spend the summer than by following BPS around Texas. As they search for the best time of their lives, they find much more than they bargained for along the way. Join L and Leah on their journey as they take a walk on the wild side, discover life outside of Farber, learn about themselves, and meet new sides of each other they've never seen before. Can their friendship withstand the most epic summer of all time? No matter what happens, they'll never forget how they spent their summer vacation. Lynn and her friends have just graduated high school, and the world seems to be opening up all around them. With big changes on the horizon, Lynn and her boyfriend have decided to make the ultimate commitment. Newly engaged and headed for a bright future, things seemingly could not be going better for Lynn, that is until she discovers that she has been betrayed by her fiancé and her best friend. Lynn cuts them both out of her life and tries to move forward, but her efforts are halted when her ex refuses to let her go. Terror ensues as Lynn’s ex continues to stalk her, but when he is finally out of the picture, the horror doesn’t end. As the nightmare continues to unfold, Lynn is faced with a horrible truth; a truth that could prove fatal. 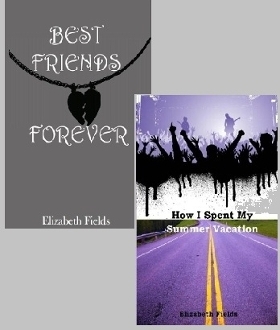 Copyright © 2016-2019 Author Elizabeth Fields. All rights reserved.